Earlier this summer, on World Population Day, we explained that half of the world’s population lives in just six countries. In many cases, the world’s major religious groups are even more concentrated, with half or more of their followers living in one or a handful of countries. For several years, demographers at the Pew Research Center have been studying the demographic characteristics of eight groups: Buddhists, Christians, adherents of folk religions, Hindus, Jews, Muslims, the religiously unaffiliated and followers of other religions. While Christians and Muslims are more widely distributed around the world, the other groups have a majority of their populations in just one or two nations, according to 2010 estimates from our Global Religious Landscape report. 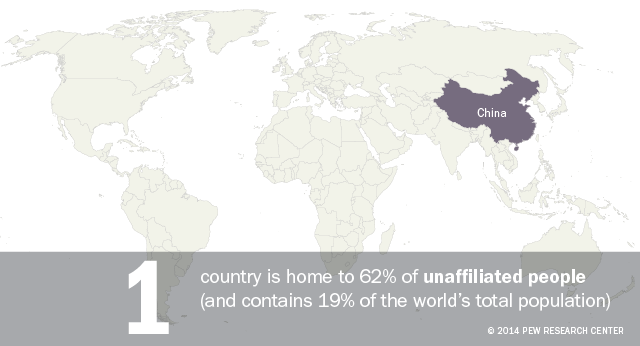 While there continues to be much attention paid to the growth of the religiously unaffiliated population in Europe and North America, more than half (62%) of the world’s 1.1 billion unaffiliated people live in one Asian country: China. China also is home to 50% of the world’s 488 million Buddhists and 73% of the 405 million global adherents of folk religions. Since China is the world’s most populous nation, it may not be altogether unexpected that it has a lot of people in a variety of categories. While China accounts for 19% of the world’s overall population, it is home to majorities of all Buddhists, unaffiliated people and adherents of folk religions. No major religion is more concentrated in one country than Hinduism, which has remained close to its geographic origins. 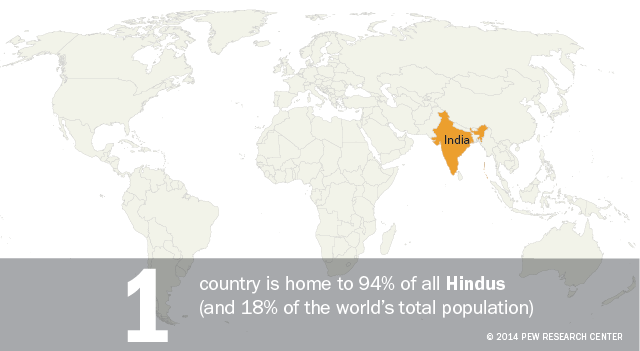 More than nine-in-ten (94%) of the world’s 1 billion Hindus live in India, which is home to 18% of the world’s overall population. 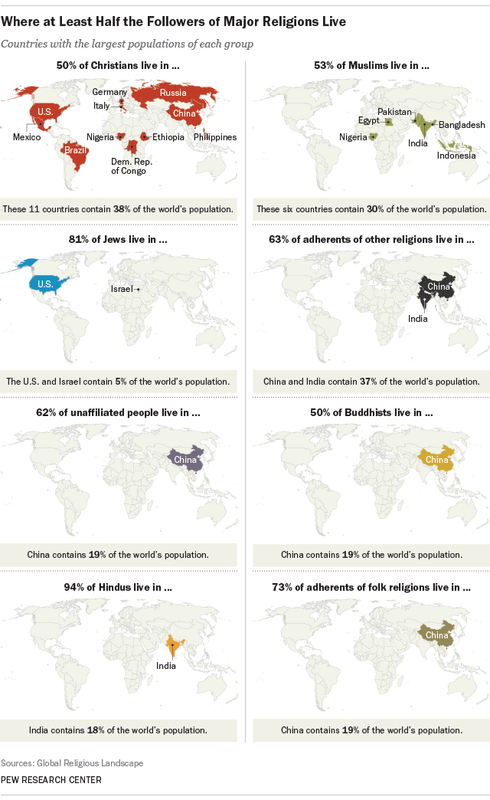 India and China have the largest shares (a combined 63%) of the 58 million people in the “other religions” category, which includes the Baha’i faith, Taoism, Jainism, Shintoism, Sikhism, Tenrikyo, Wicca, Zoroastrianism and many others. India and China also are the world’s two biggest countries in terms of population, together home to 37% of all people. Christians and Muslims, the world’s two largest religious groups, have spread well beyond their origins in the Middle East. While Islam is still associated with the Middle East and North Africa in the minds of many Americans, only 20% of the world’s Muslims live in the region. Egypt is the only Middle Eastern-North African country that ranks among the six largest Muslim populations (Indonesia, India, Pakistan, Bangladesh, Nigeria and Egypt). Those nations together account for 53% of the world’s 1.6 billion Muslims. Egypt is also the only country in the group where Arabic is an official language. 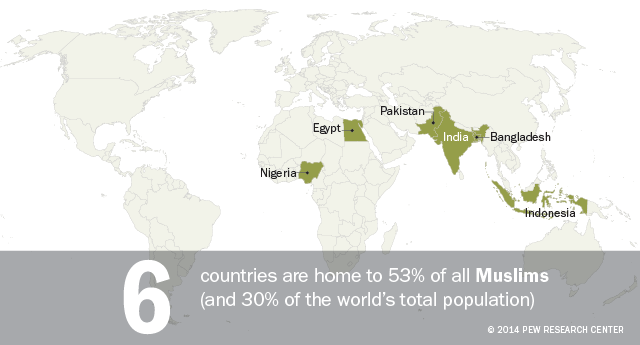 While these six countries have a majority of all Muslims, they comprise only 30% of the world’s population. Christians are the group whose distribution is most closely proportionate to the global population pattern. 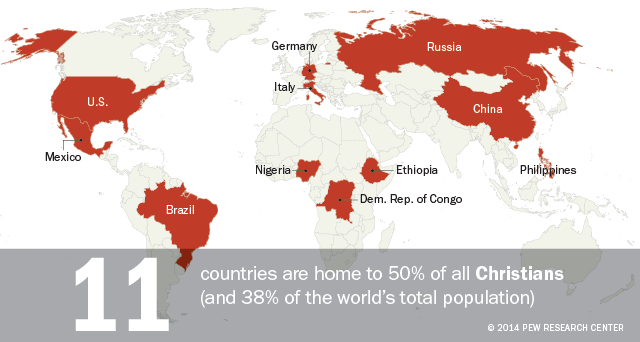 It takes at least 11 countries to total half of the world’s 2.2 billion Christians (United States, Brazil, Mexico, Russia, the Philippines, Nigeria, China, the Democratic Republic of the Congo, Germany, Ethiopia and Italy). These 11 countries make up 38% of the world’s overall population. By contrast, the concentration of Jews – a group that has often migrated because of hostile conditions, including the Holocaust, throughout its history – varies most greatly from the world’s population. 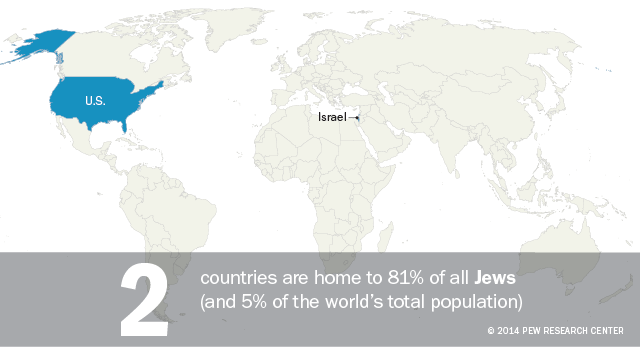 The United States and Israel each are home to about 40% of the world’s 14 million Jews. While 81% of all Jews live in these two countries, together they have only 5% of the world’s people. Joseph Naylor is an Intern in Advanced Analytics at the Pew Research Center's Religion & Public Life Project.